Besides Gaudi, Josep Puig i Cadafalch was one of the leaders of the Modernism (Catalan Art Nouveau) architecture movement, but as Domènech i Muntaner, his work was eclipsed by the ingeniousness of Gaudi. The youngest of the three rival architects possessed a really wide cultural background: he was not just an architect but also a specialist in Romanesque architecture, run archaeological excavations in the Empúries Greek and Roman site, taught at the Barcelona School of Architecture, and led an active political life as a city councilor, a member of the Spanish Parliament and even President of Catalonia for 7 years. So if you want to say you know Barcelona like an insider, not just like a tourist, you absolutely need to know about this gentleman that left a considerable amount of works in Barcelona, many of them open to the public now and pretty central, and quite easy to identify thanks to their characteristic medieval and eclectic feel. If you are spending a few days in town and have enough time to visit something else besides the Gaudi works and the Old Town, make some of Puig i Cadafalch buildings your next goal. Located in 3, Montsió street very close to the Gothic Quarter, this 4-storeys brick building built in 1896 is considered one of his first works. Besides its remarkable wrough iron pieces and stone decorated balconies, the place stands out because its ground level was home to the famous Els 4 Gats café where the intellectuals of the Modernist movement met up to discuss art, literature, politics and philosophy. One of them, the painter Ramon Casas, actually paid Puig i Cadafalch to design its neogothic furniture. And a very young Picasso used to hang out there, as well, eager to hear about the newest trends arriving from Paris at that time (that’s why we include it in our Picasso Tour). Although it was only open for 4 years, this café was crucial to the development of the Barcelona Art Nouveau style. By the way, the 4 Cats reopened in 1987 as a restaurant that has kept the original feel and decoration, and offers decent Catalan food and even piano concerts during dinner. Oh, if you go, make sure to check out #5 on Montsió street too: Casa Carreras is also built by Puig i Cadafalch. Passeig de Gràcia was the most elegant street of Barcelona, where the elite built their apartment buildings. Puig i Cadafalch built there the now gone Café Torino, the Casaramona building and one of his masterpieces: Casa Amatller right beside Gaudí’s Casa Batlló and together with Domènech i Muntaner Casa Lleó Morera being part of the famous Block of Disagreement. 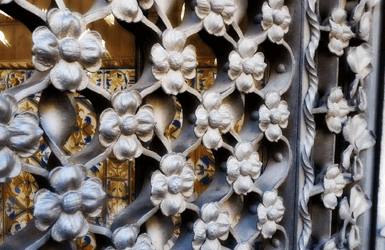 Built for the chocolate maker Antoni Amatller and his daughter (he had divorced during a short span when it was legal when he discovered his wife cheating on him), the façade of the building is full of extraordinary decoration that hides some fascinating symbolism. The building is open for visitors joining tours restricted to a small number of people each time, and high heels are not allowed in order to protect the delicate floors of the apartment. Or just feel free to check out the entrance hall (for free) with its gorgeous stained-glass skylight and have a hot chocolate at the newly open café occupying what used to be the kitchen of the house (still partially preserved). 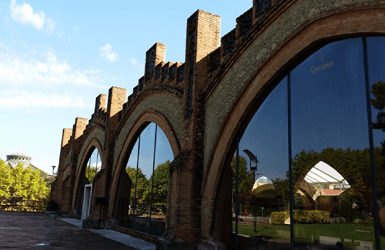 Mister Casaramona had lost his textile factory on a fire that completely restored it, and asked Puig i Cadafalch to build a new one with two tall towers that would serve as water tanks. He designed an impeccable ensemble of brick naves, each one dedicated to a different part of the textile process. The factory didn’t have a chimney, because it was one of the first in town to use electricity instead of coal. The architect also paid attention to details that would improve the quality of life of the workers, building large windows that would allow the sunlight in and enabled ventilation, and figured out systems to maintain the hygiene levels in the premises. Unfortunately, the factory went out of business in 1920, and the building had different uses until at La Caixa bank they thought it’d made the perfect setting for an art center – the Caixaforum. The building was bought and restored by the Japanese architect Arata Isozaki. Since 2002 it’s become one of the most important exhibition centers in the city. For tickets and more information click here. When you first see the façade of this mansion giving to Diagonal avenue, you could be easily tricked into believing it’s really a medieval building, with its dragons, monsters and princesses. But then you realized that it’d be placed in the wrong district of Barcelona (the Eixample didn’t exist in the middle ages). And when you turn around the corner to see its modernist façade on Rosselló street, then you realize the genius of the architect who would choose a more “classical” and serious feel for the main entrance and a lighter and happier touch to the back entrance. Comparing both façades and seeing the surprise in the faces of our guests is one of our favorite things we do in our Eixample Tours. Now the headquarters of the Ramon Llull Institute, it is not open for visitors but if you open the wrought iron gate and ask kindly to the concierge, he’ll allow you to have a look at the beautiful entrance hall. Rumor has it, that the widow of Mr. Terrades was worried their three very ugly daughters would never get married – what in those times was likely to mean disaster. So she decided to get each of them a building they could rent and make money from it. Puig i Cadafalch designed a building consisting of three separate accesses and a common rooftop, with 9 different façades (what makes it the most irregular building in the area) that adapt very elegantly to the difficult crossing where the real state was located. You’ll be delighted to know that after being closed to the public for decades, visitors are finally allowed now (get your tickets here). Manuel Raventós, heir of the Codorniu cava company, worked hard to make their family business one of the leading wineries in the area, focusing in the production of sparkling made through the méthode champenoise, learned by his father in France. In order to make his company stand out, he asked Puig i Cadafalch to design a giant cellar. It was so strikingly huge that people called it a Wine Cathedral, and they criticized it because it was way too large for the production of those times. However, Raventós and Puig i Cadafalch guessed it right: the company was to continue expanding in the following decades and the winery eventually needed even more tunnels built – making it now one of the largest cellars in the world. It is located right outside of Sant Sadurní d’Anoia in the Penedès county, and we can take you visiting it in our Wine Tours. So what about you? 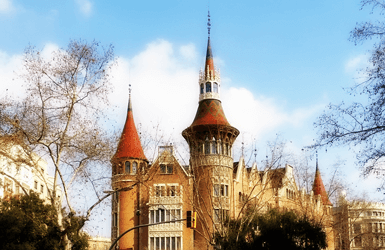 Head to the comments below and tells us: Had you ever heard about any buildings by Puig i Cadafalch and are you planning to visit any after reading this post?